Internet Freedom Wanes As Governments Target Messaging, Social Apps : All Tech Considered Apps like WhatsApp and Telegram are the latest to face crackdowns, a new report says. Two-thirds of Internet users live in countries that censor criticism of the government, military or rulers. 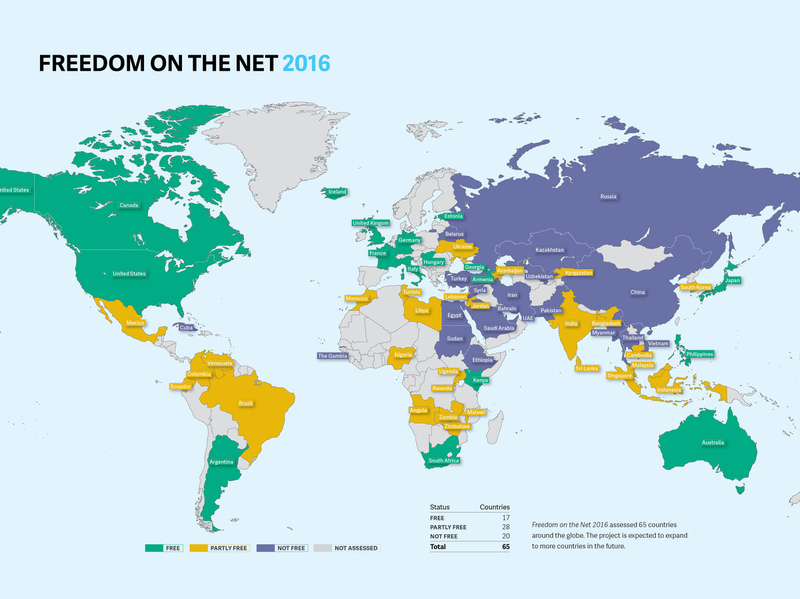 Freedom House reviews restrictions to Internet access and how it's used around the world, weighing whether countries are free, partly free or not free in terms of Internet freedom. For decades Freedom House has been ranking the world on free speech, political and civil rights. In recent years, this nongovernmental organization has extended its research into the state of the Internet. And for the sixth consecutive year, it has found Internet freedom on a decline. In 2013, it was a rise in surveillance. In 2014, governments shifted more from behind-the-scenes control to overt repression and arrests. In 2015, it was more of the same, plus a push against encryption. Over the past year, the pressure fell increasingly on social media and messaging tools, often to quash protests or dissent, according to the latest Freedom on the Net report, which covers the period from June 2015 through May 2016. 2. The apps, which are free or cheap, challenge profits of traditional phone and other telecom companies that may be friendly with governments. WhatsApp emerged as the most-blocked app, facing restrictions in 12 of the 65 studied countries. One of the incidents was in Brazil, where a court temporarily suspended the app, which belongs to Facebook, after it didn't hand over user data for a criminal investigation. This nationwide WhatsApp suspension, combined with the murders of two bloggers who criticized local politicians, resulted in Brazil's downgrade from "free" to "partly free" in the report's Internet freedom rankings. Also downgraded was Turkey, which saw "the most drastic five-year decline," according to the report. It was declared "not free" following blocks and restrictions on social media, widespread censorship of websites and Twitter accounts — "often as a countermeasure to anti-government protests, corruption scandals, or terrorist attacks," the report says. The report's scope covers the experiences of some 88 percent of the world's Internet users. 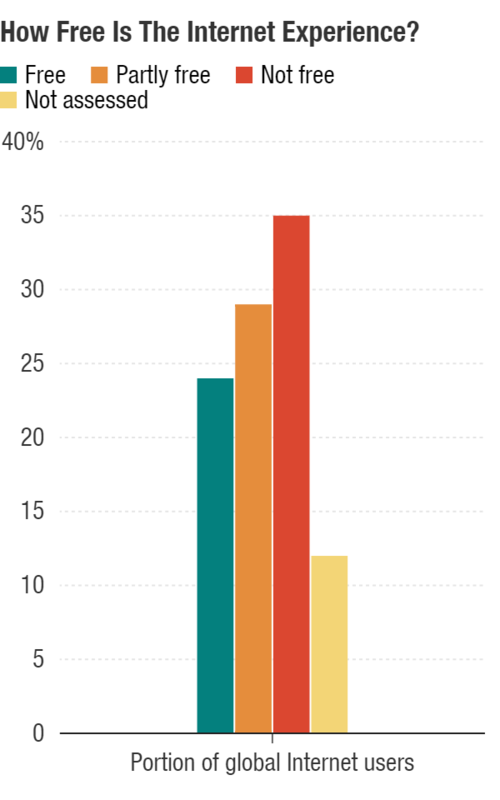 And of all 65 countries reviewed, Internet freedom in 34 — more than half — has been on a decline over the past year. Particular downturns were marked in Uganda, Bangladesh, Cambodia, Ecuador and Libya. Facebook users were arrested in 27 countries, more than any other app or platform. And such arrests are spreading. Since June of last year, police in 38 countries have arrested people for what they said on social media — surpassing even the 21 countries, where people were arrested for what they published on more traditional platforms like blogs and news sites. "Some supposed offenses were quite petty, illustrating both the sensitivity of some regimes and the broad discretion given to police and prosecutors under applicable laws," the report says. "Users in some countries were put behind bars for simply 'liking' offending material on Facebook, or for not denouncing critical messages sent to them by others," it says. "Offenses that led to arrests ranged from mocking the king's pet dog in Thailand to 'spreading atheism' in Saudi Arabia." The most free countries and the worst offenders have remained relatively steady through the years. Estonia and Iceland again had the fewest restrictions and offenses. They were followed by Canada, the United States, Germany, Australia, Japan and the United Kingdom. The U.S. moved up one notch this year thanks to the passage of USA Freedom Act, which changes the way U.S. agencies conduct surveillance and collect data. The U.S. government did, however, get called out for its standoff with Apple over access to encrypted data on a terrorist's iPhone. Similar pressure to cooperate in terrorism-related investigations and on other security matters has been felt in Europe, from France and Germany. "In both democratic and authoritarian countries, counterterrorism measures raised the likelihood of collateral damage to free speech, privacy rights, and business operations," Freedom House's report says. The most abuses of Internet freedom were once again recorded in China, followed by Syria, Iran, Ethiopia, Uzbekistan and Cuba. The 2016 Freedom of the Net report is funded by the U.S. State Department's Bureau of Democracy, Human Rights and Labor; the Schloss Family Foundation; the Dutch Ministry of Foreign Affairs; the Internet Society; and tech companies Google, Facebook, Yahoo and Twitter. Freedom House says the content of the report is "the sole responsibility" of the organization and "does not necessarily represent the views of its donors."